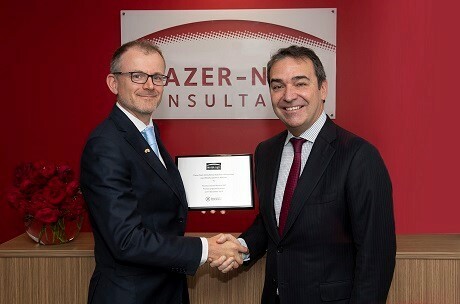 Steven Marshall, MP, Premier of South Australia officially opened Frazer-Nash's Adelaide headquarters at a breakfast event on 6 November. The Premier, together with key clients from the region, watched presentations outlining just some of the work Frazer-Nash Consultancy has delivered in South Australia. "We've created 40 high value jobs in South Australia and our fantastic, enlarged office gives us the space to create the next 40. "Our success is founded on being relevant to the future needs of our clients, being the best at what we do and caring deeply about how we do it. We align our services to transforming societal trends, such as security in a changing world, urbanisation, decarbonising energy supply whilst ensuring reliability and affordability, the increased use of technology in agriculture, and the pervasive imperative of innovation. It's this alignment that makes us so relevant to client needs and so exciting for our staff. "We were delighted to be joined by the Premier and so many of our clients on this very special day for our Australian business." Frazer-Nash's Adelaide headquarters have been trebled in size in response to increased demand for the consultancy's services in Australia. Since opening its first Australian office in 2010 Frazer-Nash has supported high-profile South Australian projects including Sundrop Farms, SIMEC Zen, the SEA1000 Future Submarine project, the Federal Government's initiative to develop a low level radioactive waste disposal facility, and the root cause analysis of power failures at the Royal Adelaide Hospital.